With no small pangs of regret, I do realize that wrapping up cousins and putting them — or at least their DNA — under my Christmas tree may not be possible… or even legal in some states. 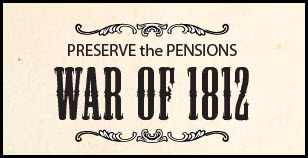 Federation of Genealogical Societies–Preserve the Pensions: First and foremost, Santa, I want a War of 1812 Pension. This massive ongoing digitization project is designed to preserve fragile records documenting more than 180,000 pension records for War of 1812 soldiers and their families. They are among the most heavily requested documents at the National Archives and, because of their use, they are in grave danger of deterioration. Right now, FGS and its partners are concentrating on getting these records digitized to preserve them and make them freely available to the public for all time. Every dollar contributed means two pages of a pension file can be digitized — and with matching funds from Ancestry.com, that becomes four pages saved. So, Santa, if anybody asks you what I want for Christmas, tell ’em a War of 1812 pension file. It’s easy; folks can donate online. Illinois State Genealogical Society: My father’s family began its migration from the Old World to the New very late — in the 1880s, when his great aunt and uncle settled in Chicago. Ours is the classic story of chain, or serial, migration, ending with my grandparents and father coming to America in 1925 — and everybody ended up in Chicago. So for help with that research and for the webinar series and the journal, gotta have ISGS membership, Santa. Now, Santa, you know it’s not so easy on my mother’s side, because we can document that her family has been in America since at least 16802 and residence in just about every state south of the Mason-Dixon line (and a few border states too). Virginia Genealogical Society: Offering the Magazine of Virginia Genealogy and the Virginia Genealogical Society Newsletter, with grant and awards programs, annual conferences and more. And just for myself, Santa, since I live here, the Genealogical Society of New Jersey, with its Genealogical Magazine of New Jersey and its GSNJ Newsletter and its seminars, its collections, and all it does to support genealogy in my backyard. So, Santa, what genealogy societies are on YOUR wish list this year? Dad’s ancestors, to my current knowledge, didn’t stray too far from North Carolina and Virginia, and those are current 🙂 Though, Kentucky and Tennessee wouldn’t be UNhelpful, for either side. In descending order of importance: ISOGG (free), NYG&B Society, Dutchess County Genealogical Society, Dutches County Historical Society, NGS, Palatines to America, NEHGS, Mayflower Society (Connecticut chapter), NSDAR (Henry Hudson Chapter), Ulster County Genealogical Society…. Notice the focus on NY. All my ancestors found NY and stayed there (blessing or curse?) except my father’s errant NJ line, which finally ended up in NY. You have all the Yankees, Doris! I have none. None at all. It’s depressing. Hope Santa listens, Gus! Merry Christmas to you too! Let’s see… I’d love NEHGS, NYG&B Society, & any societies covering the following: Jefferson County WA, Onondaga County NY, Berks & Adams Counties PA, Barrow-in-Furness UK, County Tyrone N.Ireland. More would be better than less. But I’d be oh-so-grateful if Santa were reading this blog, eh?! Cheers Judy, and I hope your buckets are full this Christmas season and in the coming 2014. Happy New Year, indeed. And to you and yours, Celia! Hope you have a wonderful Christmas and let me know if you don’t find an OGS membership under the tree. Maybe I can have a talk with Santa! Thanks for the shout out! Your awesome! Can’t wait to see you in the Fall. I’m looking forward to it, Tina, all the more since I now have evidence of Tennessee ancestors of my own!